as he battles his enemies. 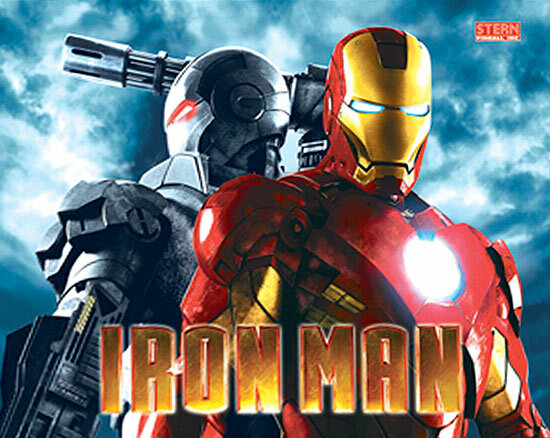 Created by the game design team at Stern Pinball, IronMan™ Pinball is based on the Marvel Studios’ blockbuster film, Iron Man, and the highly anticipated Iron Man 2 movie, opening May 7, 2010. Iron Man ™ Pinball is sure to be an especially big hit with fans of the world-renowned Marvel comic book series, animated TV series, and films. Iron Man™ Pinball features speech, art, and dot matrix display images of all of your favorite characters, including Tony Stark, Iron Man, Whiplash, War Machine, Rhodey, Iron Monger, Pepper Potts, Black Widow, and many more. 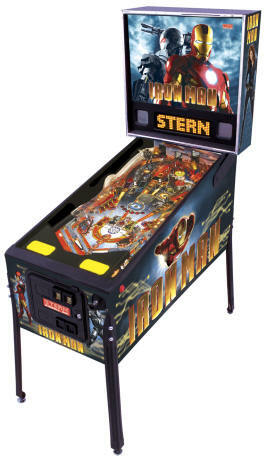 The pinball machine also contains songs from the Iron Man movie score. Pinball players will fight against Whiplash and his ball-catching mechanism, which whips the ball around the playfield. Adding to the challenge is the mechanical War Machine, firing the pinball back to the flippers, and Iron Monger, rising from underneath the playfield to do battle. IronMan™ Pinball also features two elevated ramps and lots of multi-ball action! Iron Man, the Movie ? 2008 | Iron Man 2, the Movie: ? 2010 Marvel Film Finance LLC. Iron Man, the Character: TM & ? 2010 Marvel Entertainment, LLC & subs. Super Hero is a co-owned registered trademark.